In 2001, Buffalo Wild Wings began researching a key management program that would eliminate locksmith call-outs and reduce the costs associated with rekeying a restaurant. The Facilities department was introduced to InstaKey Security Systems during their research. 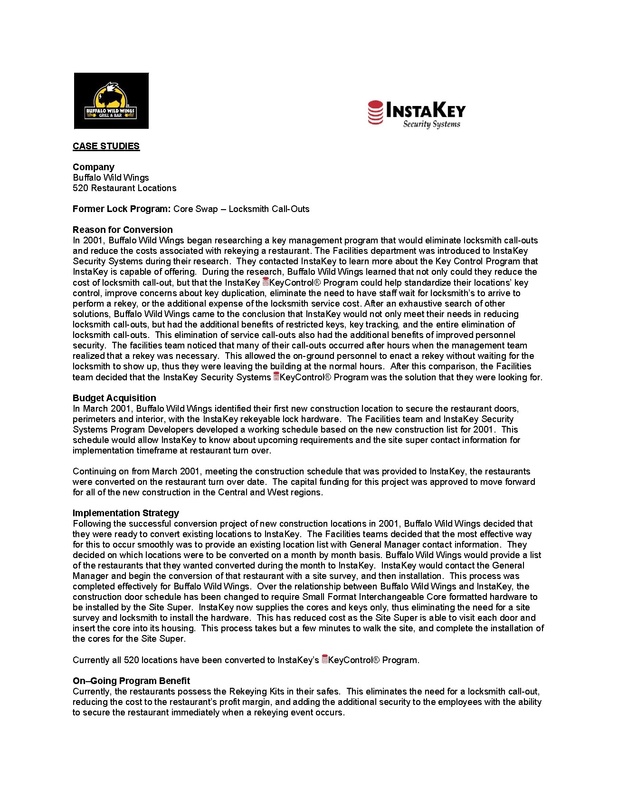 They contacted InstaKey to learn more about the Key Control Program that InstaKey is capable of offering. During the research, Buffalo Wild Wings learned that not only could they reduce the cost of locksmith call-out, but that the InstaKey Key Control Program could help standardize their locations’ key control, improve concerns about key duplication, eliminate the need to have staff wait for locksmith’s to arrive to perform a rekey, or the additional expense of the locksmith service cost. After an exhaustive search of other solutions, Buffalo Wild Wings came to the conclusion that InstaKey would not only meet their needs in reducing locksmith call-outs, but had the additional benefits of restricted keys, key tracking, and the entire elimination of locksmith call-outs. This elimination of service call-outs also had the additional benefits of improved personnel security. The facilities team noticed that many of their call-outs occurred after hours when the management team realized that a rekey was necessary. This allowed the on-ground personnel to enact a rekey without waiting for the locksmith to show up, thus they were leaving the building at the normal hours. After this comparison, the Facilities team decided that the InstaKey Security Systems Key Control Program was the solution that they were looking for.